Skylyn Webb competes in the Colorado Running Company UCCS Invitational Dec. 8, 2018. 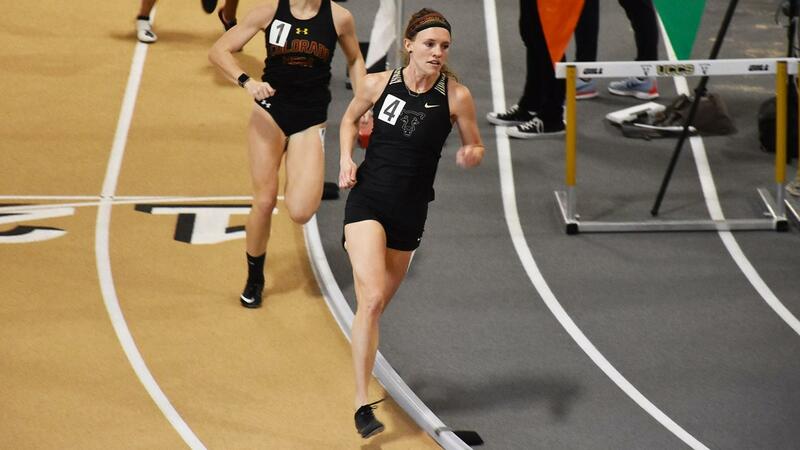 After breaking the NCAA Division II record in the 800-meter run last weekend, Skylyn Webb earned UCCS’ first indoor U.S. Track & Field and Cross Country Coaches Association National Athlete of the Week award. She also earned her second Rocky Mountain Athletic Conference Athlete of the Week award this season. Webb finished the 800-meter run in 2 minutes, 4.68 seconds at the Colorado Invitational Feb. 2 in Boulder. Her time was nearly a second faster than the previous national record set by Cedarville University’s Carsyn Koch in 2017. With the altitude-to-sea level conversion to 2:03.87, Webb leads the Division II performance lists by almost one-and-a-half-seconds. Among all athletes in the three NCAA divisions, she has the third-fastest time. Webb was the NCAA Division II outdoor national champion in 2018 with a championship record time of 2:02.47, and competed at USA Track & Field National Championships. This week’s awards mark Webb’s second RMAC award this season, and the first time in program history that a Mountain Lion has earned national athlete of the week during the indoor season. Kayla Wooten was a two-time national runner of the week during the 2018 cross country season. A Mountain Lion has earned RMAC Track and Field Athlete of the Week honors for four consecutive weeks. Webb is one of seven Mountain Lions on the women’s team with a national provisional or automatic qualifying mark. The UCCS women’s indoor track and field team is ranked sixth in the latest USTFCCCA national rankings. The Mountain Lions will host their final meet of the 2018-19 indoor season with the two-day Colorado Running Company Mountain Lion Open Feb. 8-9.